Some people think way ahead, and some are probably already planning for Halloween. They may be thinking about ordering Halloween invitations for a party, planning all of the costumes, and making a list of who to invite. Summer is a good time to plan ahead for an October party before things get busy with all the back-to-school activities, football games, homework to oversee, and the list goes on and on. The timing is good for starting to plan a party without any rush and last minute hassle. If you happen to be planning to have a Halloween party this fall, you might want to check out The Party Starts Here!.com for invitations that are the right style for you. 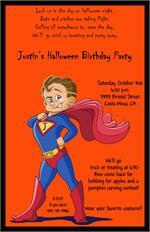 This entry was posted in Other Posts and tagged halloween party invitations by Charla. Bookmark the permalink.